Ana is a Brazilian living in China who has been learning Chinese with me for 3 months. Last week, she told me that she had been invited to a birthday party for a one-year-old baby, and the baby’s parents had told her the birthday party would start at 11:58 in a restaurant. She told me this specific time seemed strange and amusing at first because she had never been asked to go to a party at this kind of time in Brazil. Usually it would be on an hour or half hour. However, when Ana arrived at the party around 12:10pm on that day, she had already missed the beginning part of the party. She was late because the party had started at that time—11：58am. Ana felt very sorry and upset. Also, she was confused about the difference between China and Brazil, because in Brazil, it was a very normal phenomenon to get to a party a little late. Why Ana was late? Perhaps it is because she did not understand Chinese people’s strong pursuit of an auspicious number. In most Chinese people’s minds, the number 8 is a really good number, which means “prosper” and “wealth” because the pronunciation of 8 is “bā” , which is similar to the pronunciation of wealth “发（fā）”. Because this special link, Chinese people who want to seek good luck and wealth like to choose a specific time on purpose, like 10:18, 10:58, 11:18, 11:58 to start an important ceremony, such as a birthday party, a wedding ceremony, an opening ceremony, etc, and the ceremony will surely start at that time. If you miss that time, you miss the most important part of the event. In Chinese culture, Chinese people also give some other numbers auspicious or inauspicious meanings based on the Chinese word that the number name sounds similar to, not just 8. The number 5, which is called “wǔ” in mandarin, is associated with blessing 福（fú）. So, a Chinese idiom 五福临门（wǔ fú lín mén）is usually used to express a good wish, which means that five blessings will descend upon the house. The number 6（liǜ）means that everything will go smoothly. Because of this, Chinese people like to say 六六大顺（liǜ liǜ dà shùn） for good luck since it has double 6 in it. The number 9（jiǚ） is a homophone of the word for “long lasting”, which is 久（jiǚ）， so number 9 is usually linked with love. On Valentine’s Day, the men in China like to give their beloved women 9 roses, 99 roses or 999 roses in hopes that their love will last forever. Except some lucky numbers that we have talked about, there are also some unlucky numbers in Chinese culture, such as the numbers 4 and 14. The number 4 is regarded as an unlucky number because its pronunciation is really similar to the word “death” in mandarin, which is called 死（sǐ）. Due to this, some buildings in China do not have a 4th floor. The number 14 is also considered to be an unlucky number, because 14 is called “十四（shí sì）”. In mandarin, that sounds like “ten die”, and also sometimes Chinese people like to call 14 as “幺四（yāo sì）”, which sounds like “要死”(want to die), which is even worse. So number 14 is usually regarded as one of the unluckiest numbers in mandarin. 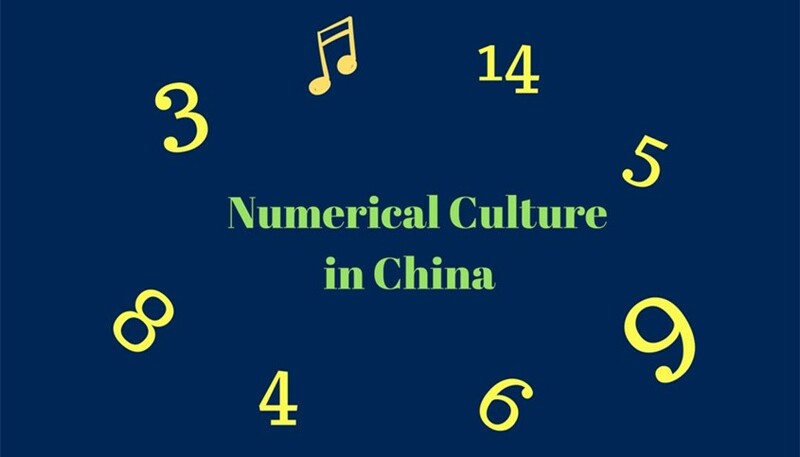 Numerical culture has been deeply ingrained into the lives of Chinese people for a long time and has been affecting Chinese people’s daily choices. Chinese people like to choose or attempt to obtain the numbers that are lucky for their phone numbers, residence floors, license plate numbers, even a specific time with good numbers, and Chinese people like to skip those unlucky numbers. Though the rules of numerical culture are not applicable for all cases in China because the pronunciation of the numbers may be different in different Chinese dialects; it is still of universal application for majority of Chinese people. After Chloe graduated from Qufu Normal University with a Master Degree of teaching Chinese to the speakers of other languages in 2013, she then went to work in the Confucius Institute in New Brunswick in Canada for 3 years. Through these 3 years in Canada, she got a lot of experience in teaching foreign kids, teenagers and adults in both areas of Chinese language and culture. The number of her students has been over 700 now. She is pretty an experienced teacher that can design studying plans according to students’ requirements and learning habits. She is good at changing the complicated grammars more acceptable and interesting for the students.